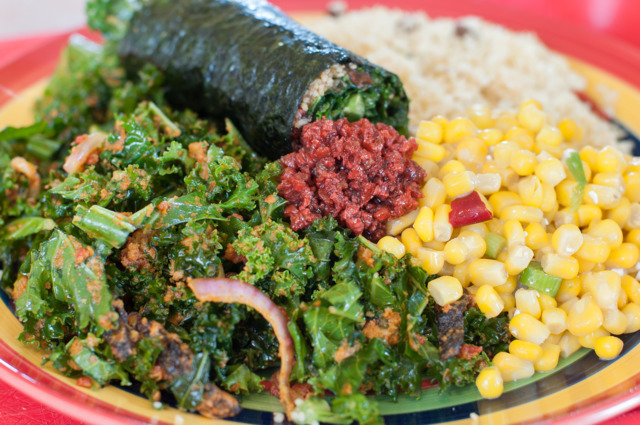 STIR IT UP: Tassili Ma’at of Tassili’s Raw Reality mixes up some spicy kale. It’s a cold and cloudy afternoon in Atlanta’s historic West End, but people are out and about. Driving down Ralph David Abernathy Boulevard, you’ll see churches of several denominations, the Wren’s Nest house museum and the Shrine of the Black Madonna Cultural Center, featuring one of the nation’s largest and oldest black-owned bookstores. There’s also a Captain D’s, a Wendy’s, a Krispy Kreme, a McDonald’s. One of the things I’ve found about the West End is that it’s really a state of mind,” says Tassili Ma’at, owner of the raw vegan café Tassili’s Raw Reality. With many of the different spiritual groups came a shared demand for healthy, plant-based foods. One of the first restaurants to meet that demand was Soul Vegetarian, led by Yafah Israel, a Baltimore native who came to Atlanta for Army training at Fort McPherson. Under the auspices of the Hebrew Israelite Community of Jerusalem, she developed a deep interest in the vegan diet that the spiritual practice prescribes and opened the first Soul Veg in 1978 to show people that going meat-free didn’t have to mean “eating rabbit food.” Initially located on Peachtree Street across from the Fox Theatre, the restaurant moved to West End in the early ’90s. Today, the space has an old-school cafeteria vibe, its half-wood-paneled walls festooned with framed newspaper clippings and photos of spiritual leaders. Locals line up for the daily lunch buffet, kalebone and meatless Garvey burger. An on-site juice bar called Return to Royalty serves up seriously addictive smoothies. Soul Vegetarian became a catalyst, inspiring healthful converts from all walks of life to open their own plant-based eateries and helping support a growing network of urban farms and community gardens. Last year, Truly Living Well, a natural urban agriculture center that helps supply some of the local restaurants, celebrated its 10-year anniversary. “We were green before it was cool to be green,” says Traci Thomas, a former Truly Living Well coordinator and founder of the Black Vegetarian Society of Georgia. Her nonprofit promotes plant-based diets by offering member discounts to participating restaurants and hosting educational events to address the disproportionate levels of chronic and degenerative diseases among African-Americans. KarbonStar’s hearty soups, salads, wraps and vegan pizzas dubbed “Sizzlas” contain no animal products, yeast or soy, though you wouldn’t know it by tasting them. Customers often come to Mbye’s shop on the advice of their doctors, who recommend serious lifestyle changes after diagnosing diet-related ailments like high blood pressure or obesity. This was the case for Ma’at, who started her raw vegan diet 10 years ago on the advice of a local herbalist after she was diagnosed with arthritis, the result of many years working her hands as a professional hair braider and loctician. She says going raw made her stiffness disappear in a week. 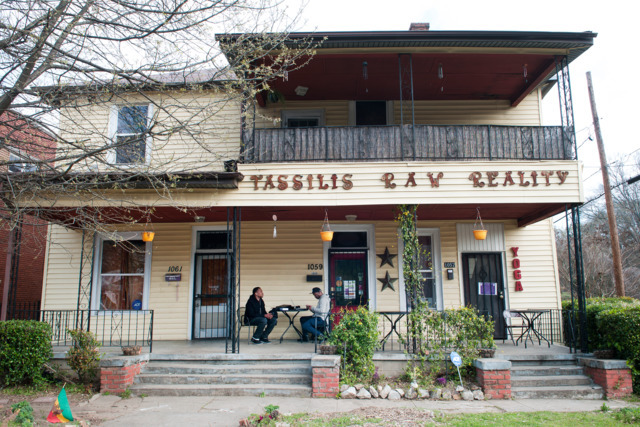 On the very first day of 2011, Tassili’s Raw Reality opened its doors. Today, the buzzing café carries the torch not only for raw vegan cuisine but serves as an epicenter for West End’s still-thriving arts and wellness communities. Set inside a ramshackle double-gallery house that dates back to 1878, the café features a yoga and meditation studio upstairs, a local art gallery in the main dining room and a garden out front during spring and summer. Celebs like André 3000 and Erykah Badu have been known to pop by for Ma’at’s famous wraps. Ma’at says the building originally belonged to a wealthy white landowner who probably had a plantation, “but the cool thing about it is that he was a leader in the community and used to have town hall meetings here. Quite naturally, we’re in the same frequency of people coming together to gather and build.” The café regularly hosts neighborhood events, workshops and Ma’at’s famous “uncooking” classes. Indeed, many of the West End vegan restaurants are actually rooted in their predecessors. Ma’at herself started Tassili’s by subletting a small space from Princess Dixon at Healthful Essence, the vegetarian Caribbean restaurant across the street. Today, she makes a point to encourage entrepreneurship within the café: Several staff members have added their own items to Ma’at’s menu, several more sell products onsite as vendors and others have gone on to open their own standalone restaurants. Vegan Dream Doughnuts and KarbonStar Vitality are both examples of the latter. “Our competition is McDonald’s. It’s Wendy’s,” Ma’at says. So far, it seems to be working. Tassili’s identity is palpable, the air of the little café thick with love. Ma’at sits at the center of it all, serene as the eye of a cyclone in her tie-dyed dress and head wrap, one long dreadlock hanging almost to her ankles, adorned in rings of silver and gold. Sitting in a corner table by the door, we’re interrupted by a constant stream of smiling friends and colleagues: Brittany Love, the “cookie fairy,” with her young son and an armful of freshly baked gluten-free goodies; several yoga teachers; an urban forager; a writer; a musician. Ma’at greets each one with a warm hug. That’s the policy around here, she tells me; this is a “hugging station” with a 12-hugs-per-person-per-day minimum. 879 Ralph David Abernathy Blvd. 1059 Ralph David Abernathy Blvd. 576 Lee St. S.W. E.
1542 Ralph David Abernathy Blvd.